Young love: sweet, tender, beautiful, devoted—the words themselves evoke a sweetness that refreshes and enlivens the spirit. We picture the groom approaching the bride at the beginning of the wedding ceremony, her face aglow, as he gently places the veil over her face. They are entering into a bond of devotion. The tenderness of these moments is shared and experienced by everyone. When we attend weddings, something tugs at our memory, a vague feeling of long ago, when we, the Jewish people, followed G‑d into the desert, as a bride with her groom. A wilderness. After 210 years in Egyptian exile, we emerged from its darkness to an unfamiliar light. Between us and the Promised Land was a wilderness. And that moment would play itself out over and over again throughout history. In life, we often find ourselves facing a wilderness. We have a vision of what we want to achieve, of the kind of person that we would like to become. Yet the journey involves being ready to travel through uncharted territory, facing the unknown. Sometimes, we back down, preferring to remain with what we know rather than face what we don’t know. A toddler will often stand in front of us, holding on to his familiar “juice bottle,” unwilling to let go of it even though we plan to wash it and fill it with delicious, fresh juice. We understand that we have something better to offer him; yet in his mind, an old juice bottle is better than no bottle at all. How do we wean ourselves of the fear of an unknown journey in life? We eat matzah on Passover. Passover is referred to in Torah by three names: The Festival of Matzot, Season of our Freedom and Pesach. The dough which we carried on our backs as we emerged from Egypt, from Mitzraim, did not rise and became matzah, unleavened bread. That very matzah became the means through which we internalized our new freedom. It attached us to G‑d and brought us in touch with the deepest part of our soul, which is a place of total safety. We wean ourselves of the fear of an unknown For the soul, the neshamah, experiences the warm embrace of G‑d at every moment, the protection which never falters. And it tastes the sweetness of our love for Him, and His love for us. With that feeling of safety, we were able to follow G‑d into an unknown wilderness. And since then, we can follow G‑d into the unknown future of our lives, without fear, trusting Him. 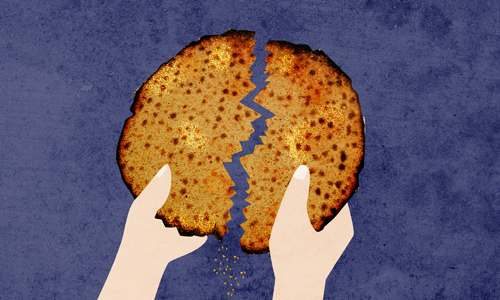 The matzah that we ate then brought those sweet feelings down into our physical lives. And so it does every year. As we sit at the Passover seder, we are not just commemorating, rather we are reliving, the Passover experience. Sara T. Best is a speaker and writer, focusing on emotional growth through the Chassidic perspective. She is a certified Lifecoach and EFT practitioner.